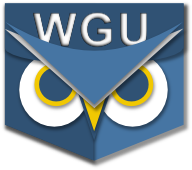 First, open up a browser and log into your Google or WGU webmail. Click on the "Log in using OpenID" link in the login block. This will redirect you to Google's website. The Google website will ask you if you want to allow pocketwgu.geofinity.com to use your account. If you choose to allow this, it will redirect you back to this site. Check your email for a message from this site containing a link. Clicking that link with log you in. From then on, you can log in just by selecting the "Google" icon in the OpenID form.When you log in to this site, you will be logged in and your profile page (on this site) will be viewable. You can make changes to your PocketWGU profile, but you DO NOT need to enter a password. This site will never need to know your password, ever! The only info this site receives is this: Google has verified your email address. Here's a link to find out more about OpenID: http://openid.net/ Enjoy! Would it be possible to use this same technique in the app itself? I'm not sure how comfortable I am sending my WGU login credentials to who knows where from any app vendor, no matter how trustworthy. It's not currently possible to support OpenID in the mobile app with existing WGU systems, but this may be doable in the future. Of course, supporting this will require that we request more permissions for the Android version of the app, so it's a bit of a double-edged sword.